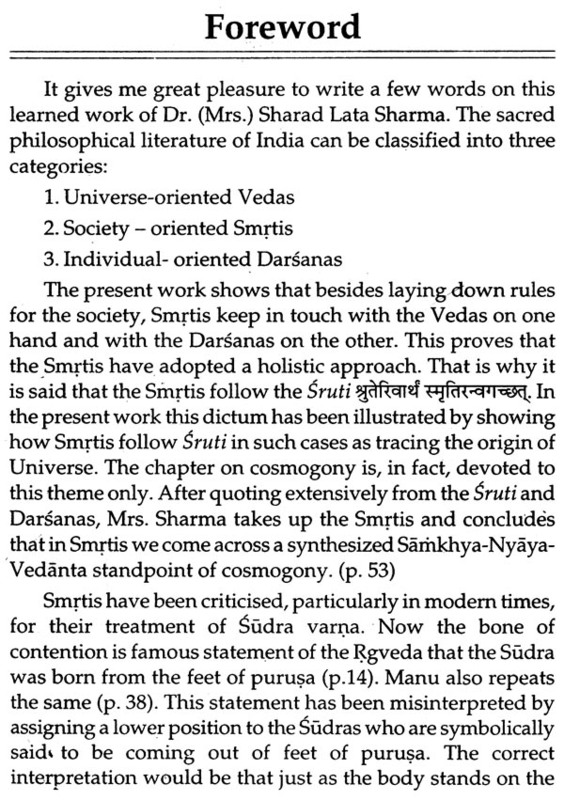 Efforts have been made in the present work to delineate the philosophy of Smrti-texts in a systematic and lucid manner to derive as to what has been eternally valuable in the ancient heritage of India. An endeavour has been made to highlight the philosophical speculations found interspersed with social, political, legal and economic aspects rather than studying the Smrtis from a historians's point of view or from a critical angle. 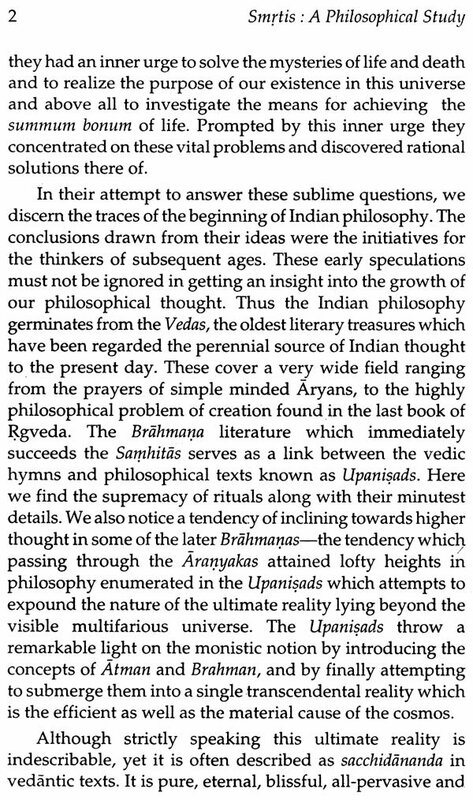 It is evident that Indian philosophy germinates from the Vedas, finds its growth in the Brahmanas and Upanisads and finally culminates in different systems. 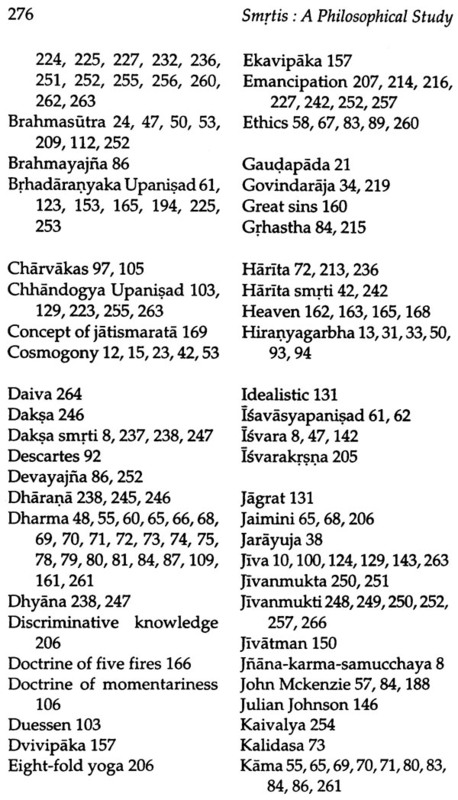 Therefore an attempt has been made to trace the origin and growth of each and every doctrine like-wise. 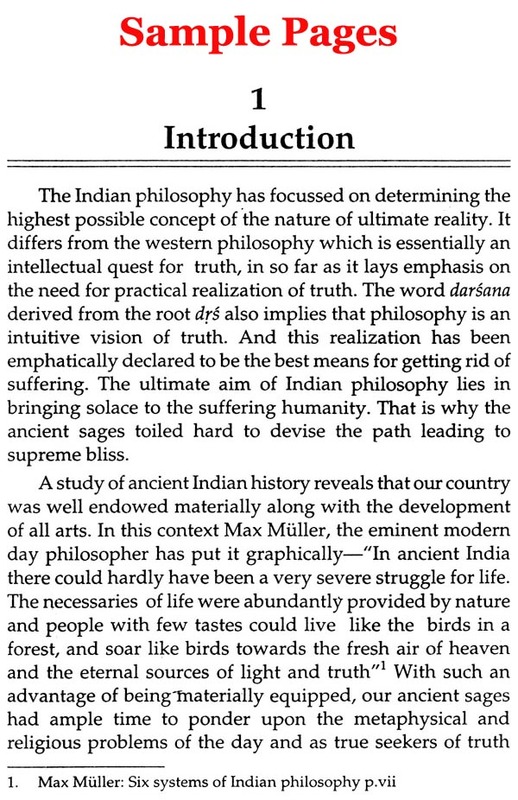 The book has been divided into seven chapters and deals with the philosophical concepts like mystery of creation. standards of mortality, the ultimate self, the law of karman and trans-migration and the path leading to ultimate emancipation. Apart from the material found in the original texts, detailed analysis has been attempted taking into account the viewpoints of commentators. 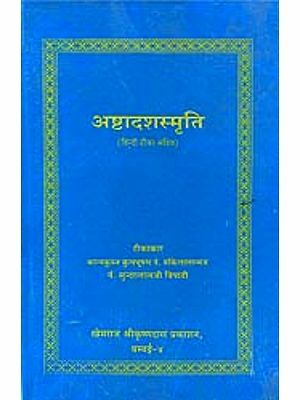 Thus representing the philosophical aspects of Smrti-literature, the present book may prove valuable to the seekers of truth. 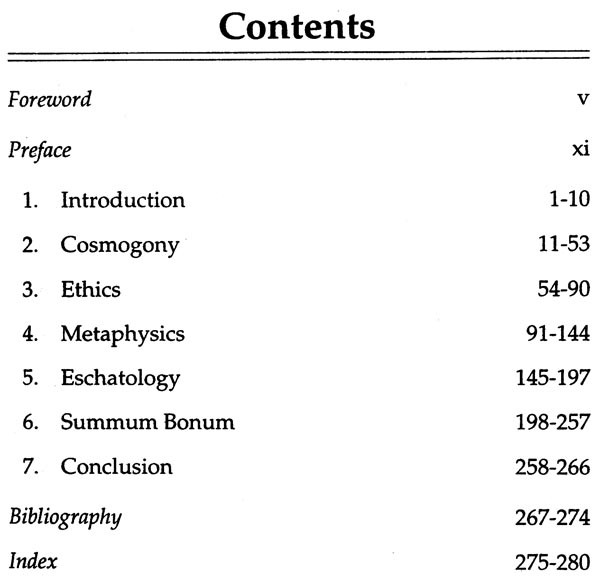 The present work is a sustained research work of my humble self presenting a comprehensive survey of the philosophical material found scattered in principal Smrtis. The word "Smrti" meaning "remembrance" stands for the literature which was handed down traditionally. 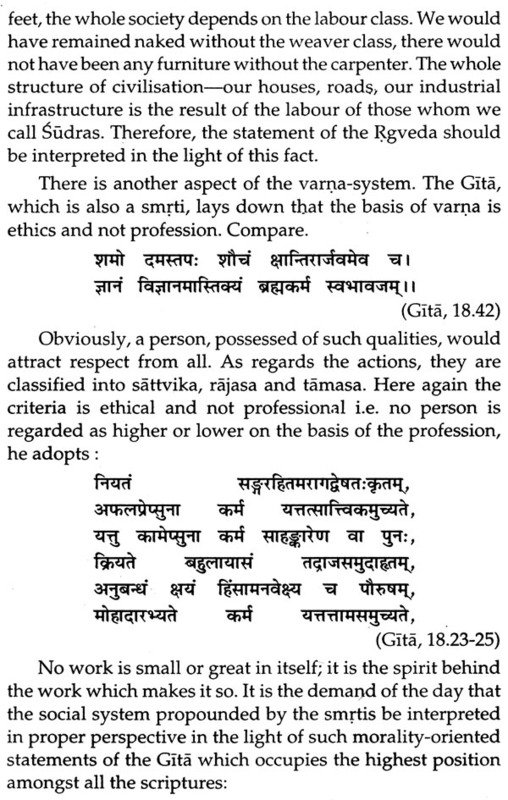 There are diverse opinion about the number of Smrtis which varies from five to fifty seven. But the commonly accepted view is that there are eighteen principal Smrtis. 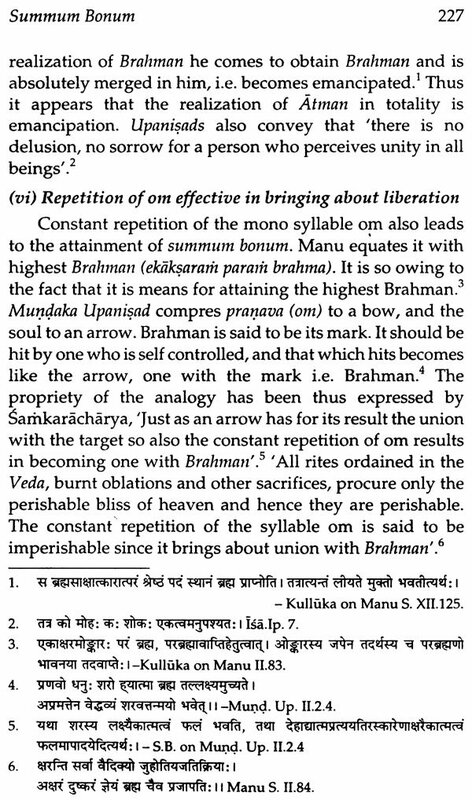 Thought I have gone through these treatises on dharma, my main focus lies on Manu-smrti and Yajnavalkyasmrti. 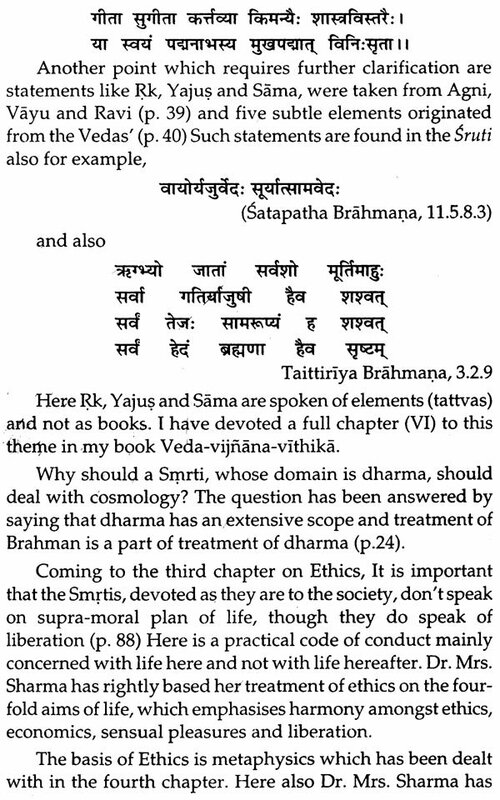 These texts were composed for promoting social welfare but still do not lack in philosophical speculations. The philosophical concepts that find place in Holy Scripture of Manu comprise of the theories of creation, the primary evidences that determine morality, means of valid knowledge, nature of self, doctrine of karma and transmigration, self-realization as a means to achieve emancipation etc. 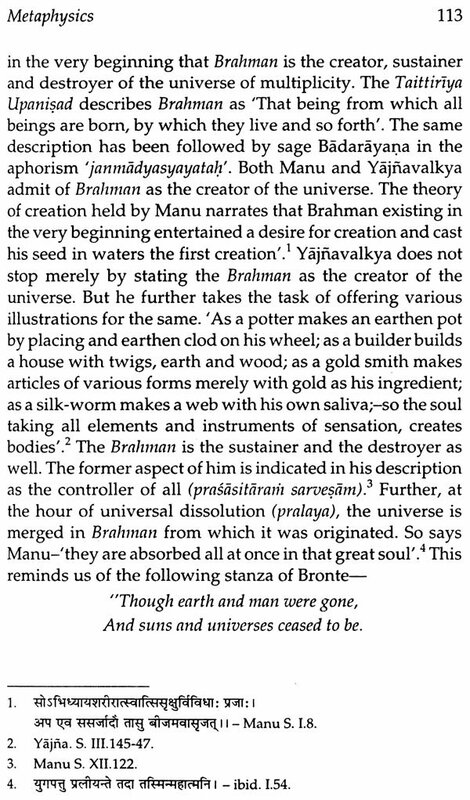 In addition Sage Yajnavalkya imbibed some other topics like the two fold path of the departed souls, the concepts of ksetrajina, eightfold yogic practices and super human powers etc. 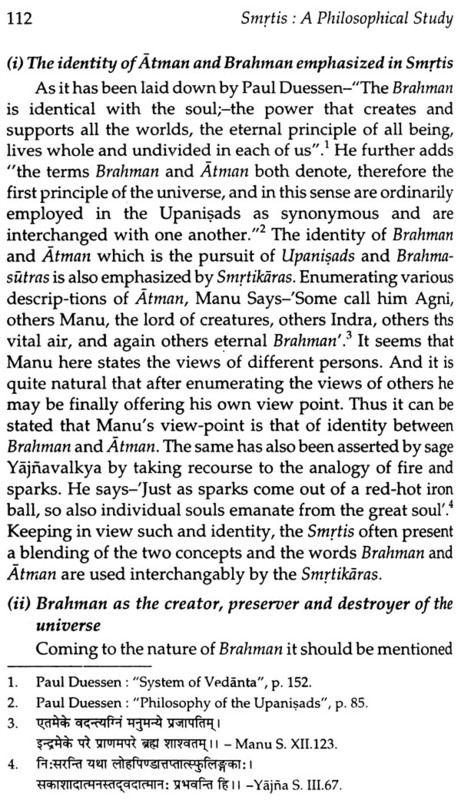 A few other Smrtis like those of Harita, Daksa, Vasistha, Samkha Samvarta etc. also contain ample philosophical material. In my exposition of different philosophical doctrines, I have also attempted to be fair and impartial to the original texts. 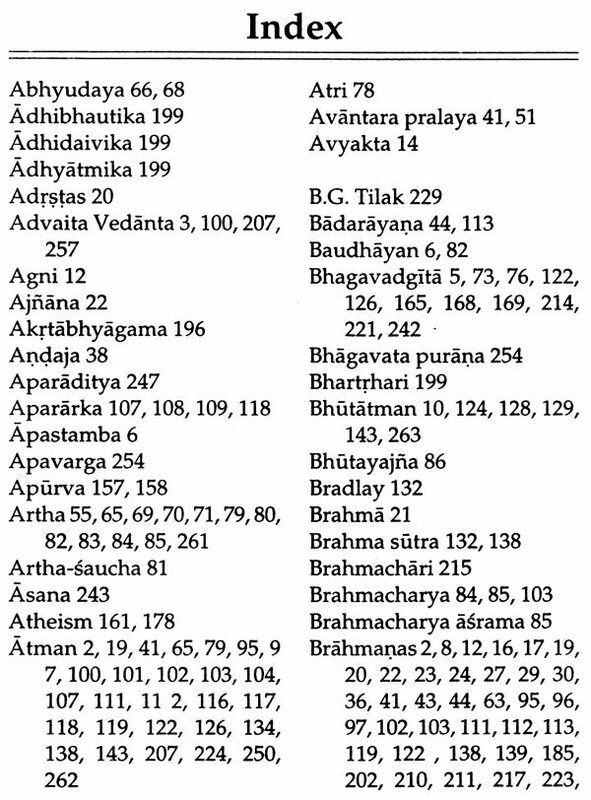 Since the entire speculation springs from the Vedas, the earliest literary records of our country, I attempted to trace the origin of every doctrine in ancient literature. 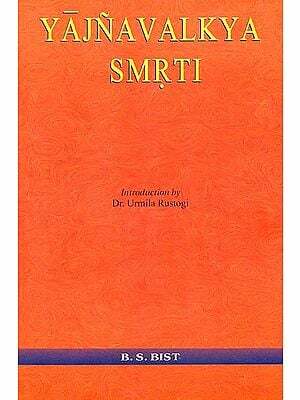 Before analyzing them as gleaned from Smrti literature, their exposition in six systems of Indian Philosophy has also been taken into account so that the smrti viewpoint could be aptly related to a particular system of thought. The elucidations presented by revered commentators have enabled me to present my viewpoint in wider perspective. 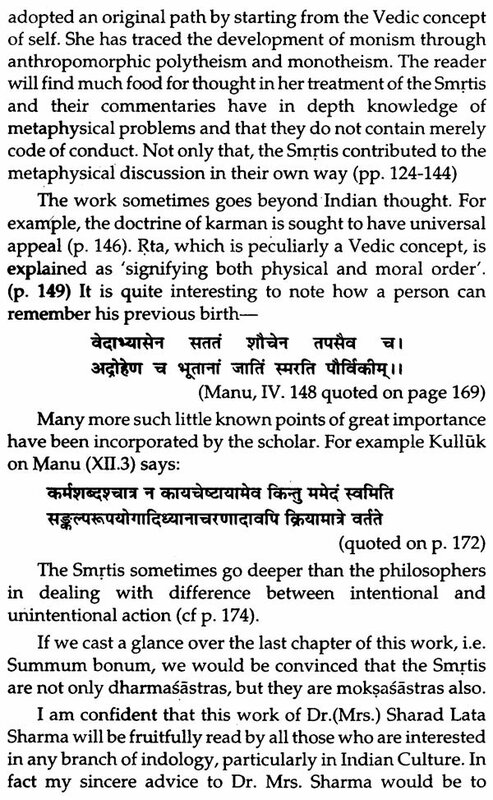 Citations from thinkers both ancient and modern, eastern and western have also been incorporated while presenting the view point of smrti writers. It was my privilege to undertake the present research work under the guidance of my esteemed teacher/philosopher Late Prof. Vachaspati Upadhyaya, ex-Vice Chancellor, Lal Bahadur Shastri Rashtriya Sanskrit Vidyapeeth whose erudition, vision and intellectual eminence is our pride treasure. I am beholden to him in many respects for his invaluable suggestions and supervision. I express my heartfelt gratitude to my revered teacher Prof. Satyavrat Shastri, the then Head of Deptt. of Sanskrit, University of Delhi for being an enormous source of inspiration to me. The publication of the work owes much to my respected colleagues Dr. Mohan Chand and Dr. P.K. Panda, Associate Professors in the Deptt. Of Sanskrit, Ramjas College whose presistent inspiration helped me in bringing out the present book and am profoundly grateful to them. 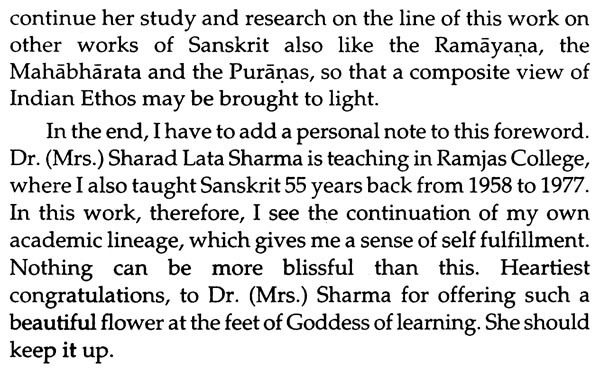 I am particularly grateful to Prof. (Dr.) Mahamahopadhydya Dayanand Bhargava, Chair-person, Pt. 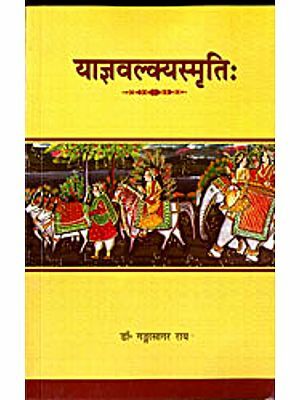 Madhusudan Ojha Veda-Vijnana Pitha, J.R. Rajasthan Sanskrit University, Jaipur for having taken the trouble of going through my work and writing scholarly Foreword to it. I shall be failing in my duties if I do not acknowledge the eminent scholars whose works have been a source of help and inspiration for penning down my work. Lastly I express my sincere thanks to the Eastern Book Linkers, Delhi for publishing the work with great zeal and promptness.